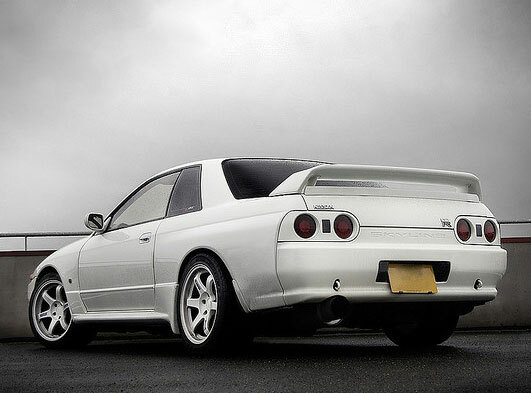 The R32 GTR is the model which made the Nissan Skyline GTR car famous worldwide. It was also the first GTR of the modern era, made between 1989 to 1994. It was universally praised for its handling, and road holding ability on both public roads and on the race tracks. It had huge success in Japan, Australia and across the world in racing, dominating touring car classes so much so that in some countries they changed the rules so that the car could no longer be competitive. This famously happened in Macau 1990 when the car lead from start to finish and caused outrage from BMW and other European manufacturers in the race. This made the car carry a 140kg weight penalty for the following year. In Japanese JTCC touring car, the R32 won the championship every season from 1989 to 1993. This dominance effectively lead to a change in JTCC rules to make it more competitive so other manufacturers could challenge. The superb chassis of the GTR was matched with an engine which in various forms would stay in the car for nearly 20 years, which is the superb RB26DETT. Producing the “gentlemen's agreement” maximum for Japanese cars at the time 276BHP (officially anyway), it was a titan of an engine. The engine was a 2.6 litre inline 6 twin turbo unit. Tuners have since made road legal GTRs with power over 1000BHP. More realistically for everyday driving, it is easy to get 400-500 BHP from this engine, when made at the time V8 Ferrari’s did not reach 400BHP. This is partially due to the R32 concept being designed with up to 600BHP in race trim. Despite its huge critical acclaim as a sportscar for its performance, its looks were always criticised. Being based off the standard Saloon / Coupe Skyline model, meant it was purposeful and bold but never a headturner in the way a supercar like Ferrari or Lamborghini are. However while it held these concerns at the time, the R32 model of the Nissan GTR has arguably stood the test of time better than the later R33. Being more square and smaller gives it more of a classic car look when found in standard trim. Due to the immense potential of the engine, and the subtle bodywork of the Skyline, over the years car fans have modified the Skyline GTR so much that it is hard to find a pristine original example. If you can then you are not only driving a classic supercar but you have the rare treat of owning a car that will appreciate in value. Thanks to the success of the new Nissan GTR, and the age of the original R32’s they are a rare breed, but a sought after model. The closest you can get to driving part of the lineage is by doing a Nissan GTR driving experience day in the new car. Once again the R35 Nissan GTR reset the standards of supercars, however unlike the previous generations of Skyline based models, the Nissan GTR is based entirely as a custom one make model. The Skyline is now a separate model to the GTR. In the US this is badged as the Infiniti G37. While they both share the unique tail light configuration and the GTR badge, the two cars are separate from now on. However the GTR names offers a driving experience like no other, and is something to be remembered.